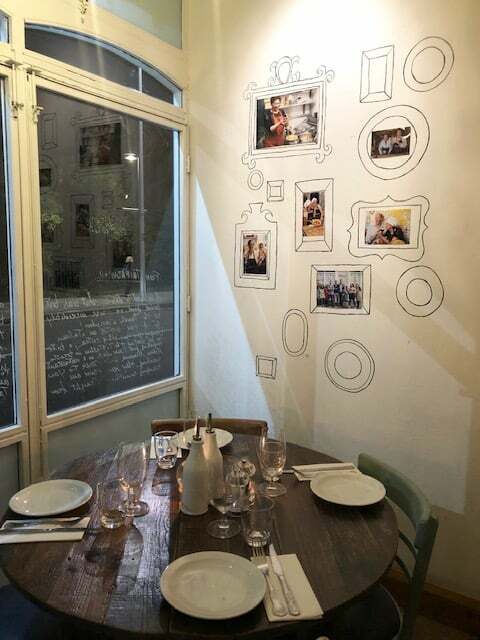 We absolutely love the concept of La Mia Mamma restaurant in Chelsea. Every three months customers embark on an Italian culinary journey focusing on one of the Italian regions. 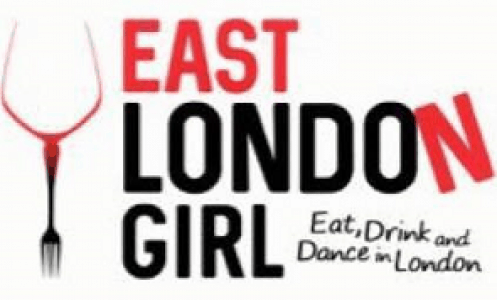 The mammas travel from Italy to London with their recipe books to serve their favourite dishes from their local region. We visited this homely restaurant during Emilia Romagna season which is just east of Tuscany. Emilia Romagna is known as “La Grassa”(the fat!) which is the homeland of some of Italy’s freshest and most authentic pastas. One thing we noticed immediately was the amount of Italian diners in the restaurant which is always a good sign. We were also greeted with a Buona Sera on arrival (good evening) which is actually rare in London. 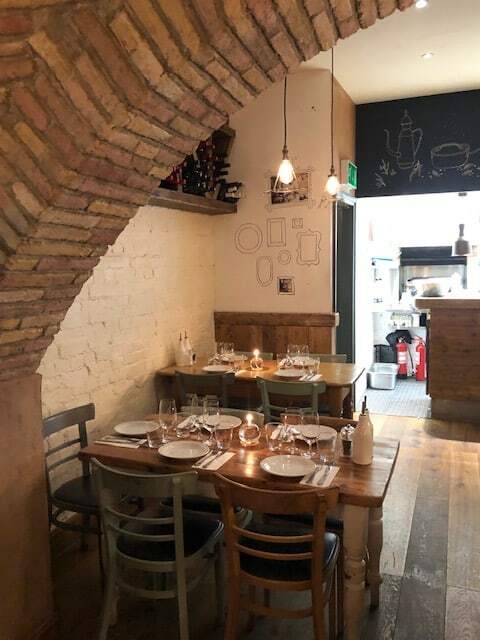 The restaurant is split over two floors with seating at the lovely bar area and tables dotted around surrounded by exposed brickwood and photos of the Mamas and maps of Italy. There are al carte items available which cover all Italian regions but it was all about trying the local region for us! 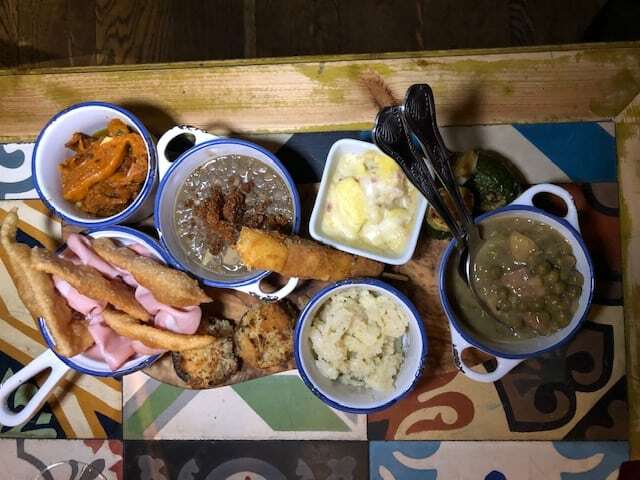 La Mia Mamma offers ‘Mamma’s Menu’ (2 people minimum) where you can build your own menu. The best bit is that dessert and espresso are always included! You can choose from Antipasti to share and pasta (£28pp), add on a Aperol Spritz (£33pp) and add on a main dish (£38pp). Given how much food you get (read on!) the menus are great value. 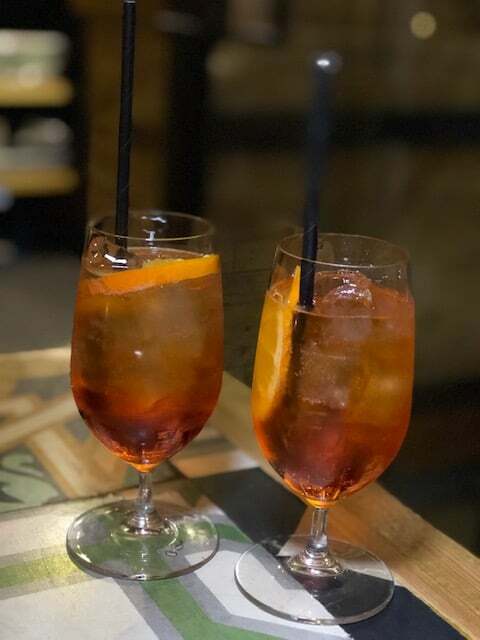 We obviously kicked off with an Aperol Spritz as an Italian feast is not the same without one nowadays… The antipasti selection to share changes daily depending on mamma’s mood and we can assure you it is plentiful! Served in small bowls on a platter we had a selection which included mushroom gratin, marinated fried pumpkin, stew of potatoes and beans, potato with bechamel sauce and parmesan cheese, stuffed courgette and gnocci fritto! We have never had such a large antipasti selection! It wasn’t the prettiest but it sure was tasty with lots of variety. There was a selection of five pastas (most of which are homemade daily) to choose from. We opted for the Tortelloni ricotta e spinaci with butter and sage sauce and lasagne of the day (meat Bolognese). Served in small frying pans, the pasta dishes looked fantastic. 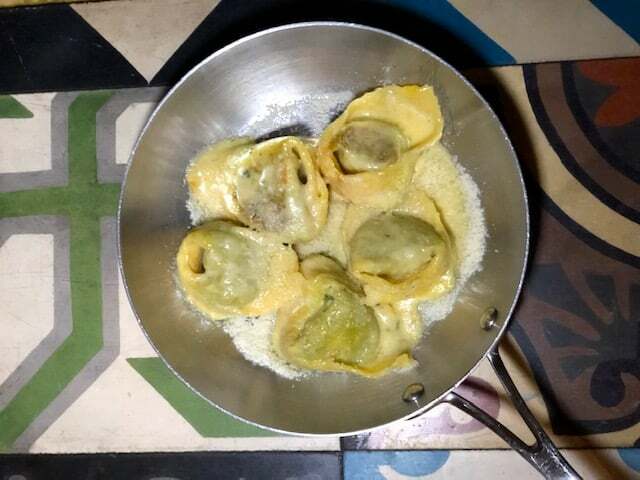 The Tortelloni was AMAZING– it tasted so fresh, al dente and was stuffed with filling. If I was being fussy, a little more butter and sage would have been preferable but it was incredible. As we were pretty stuffed, we shared a dessert (there was a selection of five). We chose the recommendation of chocolate salami made from cocoa, broken biscuits, butter and eggs! 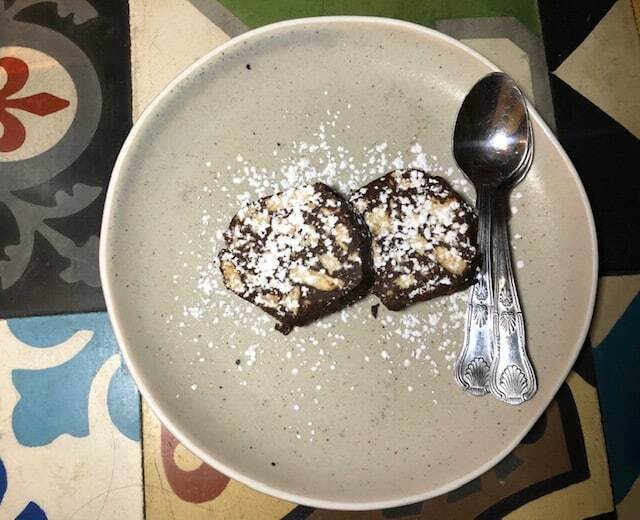 It was a small treat, perfect to share at the end of a big meal. 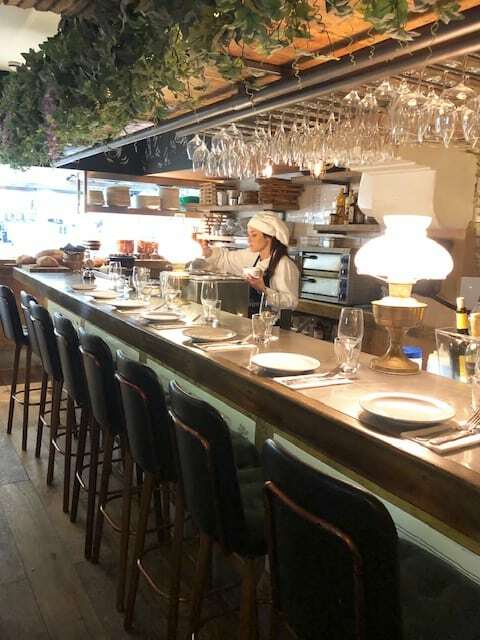 La Mia Mamma is a must visit Italian restaurant in Chelsea. The food was fantastic, we loved the rotation of different Italian regions and the service was lovely.